Mother Teresa, was a Roman Catholic religious sister and missionary who lived most of her life in India. She was born on August 26, 1910 in today's Macedonia, with her family being of Albanian descent originating in Kosovo. "the hungry, the naked, the homeless, the crippled, the blind, the lepers, all those people who feel unwanted, unloved, uncared for throughout society, people that have become a burden to the society and are shunned by everyone." Members the Missionaries of Charity must adhere to the vows of chastity, poverty and obedience as well as a fourth vow, to give "wholehearted free service to the poorest of the poor". 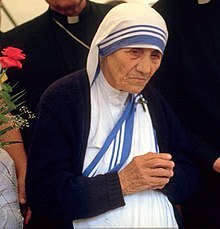 Mother Teresa recieved numerous honours including the 1979 Nobel Peace Prize. In 2003, she was beatified as "Blessed Teresa of Calcutta". A second miracle credited to her intercession is required before she can be recognised as a saint by the Catholic Church. She suffered a heart attack in Rome in 1983 while visiting Pope John Paul II. After a second attack in 1989, she received an artificial pacemaker. In 1991, after a battle with pneumonia while in Mexico, she suffered further heart problems. She offered to resign her position as head of the Missionaries of Charity, but the sisters of the congregation, in a secret ballot, voted for her to stay. Mother Teresa agreed to continue her work as head of the congregation. She died on September 5, 1997. She founded the Missionaries of Charity. She recieved a Nobel Peace Prize in 1979.